Gelty: At the end of a fifteen hour day, this is all I need. At the end of a fifteen hour day, this is all I need. It all started today at 6:00 a.m. After playing musical beds with my four year old last night, she woke up ready to play. Shortly thereafter, the eighteen-month old got up and we were off two the races. Two kids up, fed and ready for school. Check. Clothes taken in to consignment, Nordstrom Rack visit. Check. Networking meeting, more shopping, get girls from school. Done. Two kids fed, adult dinner prepped, two kids bathed and the little one sleeping. TIME FOR A LARGE GLASS OF WINE. Then I remembered, my fashion find of the day. I am sporting them right now, and they are amazing. This is quite possibly the best fifteen dollars I have ever spent. 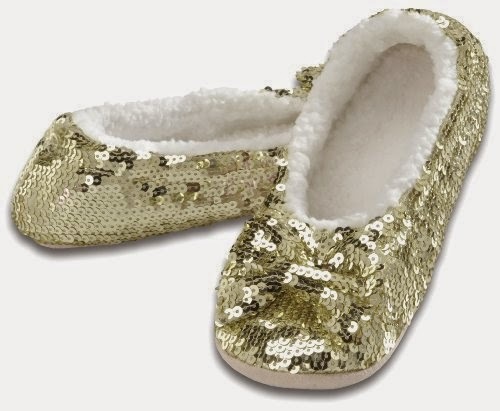 The super glam slippers below are sequined geniuses, ready to make your princess obsessed, little girls, jealous (bargaining chip anyone?). They are fleece lined, machine washable and utterly dreamy. My gym socks are officially retired from my after work wardrobe. I found these today at Castle Home Decor in Cherry Creek. The store is certainly not my go to fashion mecca, but it will be my go to gift spot from here on out. You won't believe how many great things there are to buy in this fantastic store. I had the pleasure of meeting Sydney Kelker there today, and after showing me her stash of Snoozies in her register drawer, I was sold. So if your days are like mine, and you need comfort more than Christian Louboutin's, I suggest heading for some Snoozies, ASAP.